The Nubian Goat is a common Dairy goat raised typically as a milker and staple of the American hobby farm. The Dwarf Nubian Goat (or Nubian Dwarf Goats) is a cross between a Common Nubian Dairy and a Nigerian Dwarf Goat. This cross is achieved by breeding a Nigerian Dwarf Buck with a Nubian Dairy Doe. The resulting kid will be a Nubian Dwarf Goat. Originally called the Anglo-Nubian, this breeds name has been shortened to just Nubian Goat in the United States. It was originally developed in England as a result of mixing breeding stock from Africa and the Middle East. The Nubians are large in size by Goat standards (over 200 lbs) and can come in many colors, (you can even find spotted Nubian Goats for sale!) but is mostly noted for its long/floppy ears and cute Roman nose. Nubian Goats are known as great milker and are one of the leaders in butterfat production amongst goats. They are an exceptionally hardy breed how survives well in low temperatures and requires only a modest shelter and windbreak. For this reason they have become popular in the northern States and Canada, as they are able to survive the harsh winters much better than many other breeds. If you are interested in a smaller option than the Nubian dairy goats, then the Nubian Dwarf goat (aka miniature Nubian goat) might be for you. Only getting to around 100 lbs., the Dwarf Nubian is roughly half the size of their larger counterparts but still larger than the tiny Pygmy Goat. However, despite their small size they still produce about 2/3 the milk that the full-sized Nubian does! Talk about a milk machine! Dwarf Nubian Goats will still retain the floppy “rabbit” ears and Roman nose of the full-sized Nubian has, making them every bit as cute, but perfect in size for elderly farmers or the disabled person who has trouble dealing with a large animal. As we mentioned earlier, the Nubian Dwarf Goat makes a tremendous amount of milk for its size and the milk is supplies is rich and creamy, making it perfect for cheese making, yogurt, and butter! If you own a hobby farm, full-sized, farm, or are just interested in finding out more about Nubian Goats and where to buy them, there are plenty of places that you could buy one close to you! Finding a Nubian Goat For Sale can be as easy as asking a neighbor or local farmer if they know anyone who has some available. Since it can be difficult to sell goats (most livestock auctions no longer sell goats) farmers who are looking to get rid of their goats can often times have a hard time locating a good buyer. Ask around your friends, or head to the local coffee shop/gas station where the retired farmers hang out in the mornings and ask them if they know anyone who has a Nubian Goat for sale. You can also look in the local classifieds or online for Nubian Goat breeders. Many times a breeder will list their goats in a local farm paper, or even the classified section of the local newspaper. You can also find lots of goat owners by heading to your local county fair during the summer and speaking with the goat exhibitors. If they can’t point you in the right direction than no one can! There are quite a few places to look online for Nubian Goats and Nubian Dwarf Goats. Some breeders have their own websites where they will list their goats for sale. A simple Google search with your states name + Nubian Goats should show you all the breeders near you who may have Nubian Goats for sale. In addition you can check on the popular website goatfinder.com. 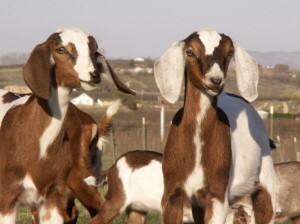 They have listings for all different types of breeders and currently have over 100 listed just for Nubians! However, the website isn’t updated often so many of the breeders listed on there no longer have websites, or no longer sell goats. Another great resource to help you find your Nubian is the use the International Nubian Breeders Association website. This great group has an up-to-date listing of member breeders in the United States and you can trust that they are high quality breeders since they have been certified by the INBA. After you have found and brought home your first goat, one of the main objectives for most owners is to turn it into a great milker. After all, Nubians are known for their exceptional milk! There are many great resources online to find helpful tips about raising your Nubian. Here are a few of the very best! You will need to make sure they have plenty to eat. In addition to grazing you should supplement their diet with alfalfa and clover, as well as a concentrated goat feed that has high protein content. Diet is one of the most important factors in quality milk production, so don’t assume that grazing alone will be enough to produce high quality milk! Make sure they have a solid housing structure. 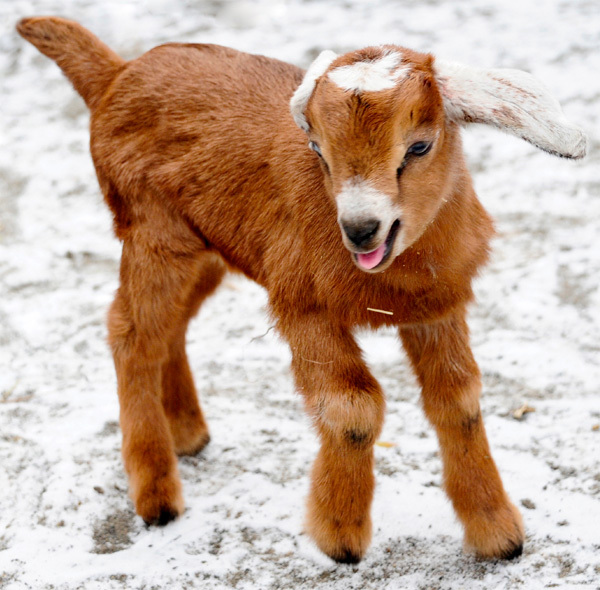 Goats are hardy, but they are still susceptible to the sicknesses that come with cold weather. A sick goat doesn’t produce good milk and you want them to be comfortable and healthy at all times. Make sure they can get plenty of exercise. Don’t keep them penned in all day or in the barn for 23 hours a day. Have a large pen they can run around in when they want, and in the summer months if you can let them graze during the day it will help their health and nutrition. Be consistent with your milking times. Most farmers know this, but if you are new it may not seem so obvious. Goats work on a schedule and if you milk at 4:00 p.m. one day and 7:00 the next, it is going to throw them off. Have a schedule and stick to it the best you can.